I'm feeling ok today. 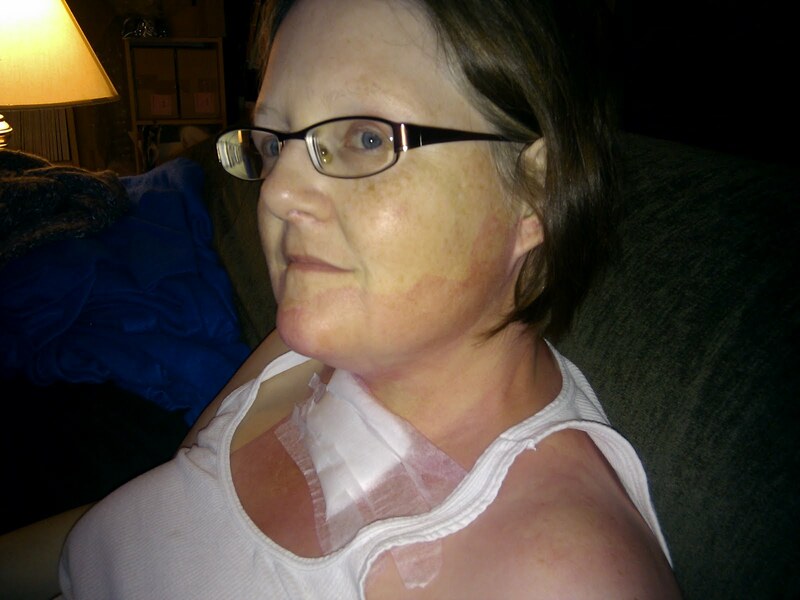 The incision is quite sore, as is my throat, my neck is very stiff, I have a headache, and some of my muscles are sore too. I'm coughing up stuff, too, presumably from the bronchoscopy. The surgery was scheduled for 1pm and I was asked to arrive around 10am for all the admitting stuff. We got there a few minutes early and checked in and the person set up my chart and printed a LOT of stickers with my name and details on them for use on everything. All the stickers they'd printed during pre-op couldn't be used, you see, because my patient number was different from pre-op to the recovery area. We waited a few minutes and got taken to my bed in the recovery area so that the nurse could admit me. She said she had to put an IV in and I asked if she could possibly use my port. She said yes and called the IV techs. I was so excited - which was apparent to everyone. The thought of having them fuss with an IV would have been too much for me. I learned something from the IV tech, as well: the fluids can't just drip into the port, they have to go through a pump. Otherwise, the fluid can put too much pressure on the port. After the IV was set up and I was changed into my lovely hospital gown, we waited and waited and waited. Eventually someone came by and said that the doctor was running early by about a half hour. This was very exciting news... but then it turned out that he got called up to help someone else and we started five minutes late. Normally as they wheel you into the operating room, they make you take your glasses off. When the anaesthetist who was taking me found out that I couldn't distinguish faces without my glasses, he let me keep them on so that I could see everyone's faces when I met them. I really liked that; it made me feel much more comfortable. Of course it meant that I could see everything in the OR, but that was ok.
As we were waiting for the doctor to arrive, we were joking around about where I work. They had to check my mouth size for the tubes and I said that I had a kid-sized mouth. The nurse asked if my boyfriend minded (!) or if he was used to it... I had no answer. What do you say to that? Weird. After that, the anaesthesiologist started injecting fentanyl into my IV... and I woke up in the recovery room with one of the worst headaches I've ever had. I was wearing an oxygen mask and for some reason the oxygen mask made the headache worse. The nurse put a cold cloth on my forehead and an ice compress on the back of my neck. I also started having pain in my incision and she gave my Dilaudid through the IV and Gravol in case I was nauseous. I found out later that they'd given me Zofran via IV and that this can cause migraines. I've taken Zofran by mouth before but never IV, so maybe it did give me a migraine. I fell asleep and woke up to the XRay techs there to take my chest XRay. I wasn't expecting that but woozily complied with their requests to sit up and take a deep breath. I asked about the XRay later and was told that they do it because in some cases, the bronchoscopy can cause the lung to collapse or bleed. Fortunately, nothing was/is wrong with my lungs. At this point my oxygen level kept dropping. It sits about 96% normally, which is a bit low but expected because of the Fentanyl patches, and they'd given me the Dilaudid, another narcotic that depresses respiration. So of course my oxygen level was low, so they put one of those oxygen nostril thingies on me and that kept it up. When I was taken back to the regular area, Ian came to see me. They asked if I wanted something to eat or drink, which of course I did because I was starving and thirsty. They gave me a can of ginger ale, four crackers, a thing of grape jelly, and two digestive cookies. I ate and drank it all and then I fell asleep. I woke up about three hours later, just after six, with Ian still at my side. I guess the nurse had come by to check my vital signs but Ian told them to just let me sleep. The nostril oxygen thingy was on me the whole time which helped me sleep. When I woke up, they checked my blood pressure and pulse and then got me to the bathroom. Once I did that, they called for the IV tech to disconnect the port and when that was done, I got to go. They faxed a prescription to my pharmacy for T3s - which is funny, because when they asked me what pain medications I didn't like, I said "codeine", which is the narcotic in T3s. So much for that. Of course I had all that pink stuff on me when I came home; I guess it's some kind of sterilizing stuff. We were able to get most of that off pretty easily even though the nurse said it would be a while before that happened. I do have welts under where the heart monitor thingies were, so now I know that I'm sensitive to that adhesive, too. Sigh. I wonder if taking Benadryl before having to have these adhesives put on me would prevent these welts? The usual instructions are to keep the dressing on for two days but the doctor told me that I should keep mine on for three days because there are no steri strips over the dissolving stitches. So I'll keep them on until Saturday, I guess. Until then I'm not allowed to submerge the gauze or stitches in water. I can still have a bath but I can't submerge myself the way I prefer to. Oh well. At least I can still have baths. So that's it... it went pretty well, I think. Ian's been taking good care of me yesterday and today. He stayed with me all yesterday and was with me after I got up this afternoon. I slept until 1:15pm today and I expect to sleep more tomorrow and over the next few days as I heal. I'm looking forward to getting the biopsy results from my oncologist on June 11. I didn't cut out my fabric today. I took some time to pick out the fabric, and I decided on a cotton-lycra blend fabric in blues and greens that I bought a couple of years ago. I love the colour and the design but when I bought the fabric I didn't realize that the fabric pattern has a strong horizontal repeat. Since the pattern I'm using for this dress has bias-cut side panels I thought that this fabric would be less horizontal and would actually look good. So I spent some time trying to figure out how to match the pattern along the seamlines. The width of a horizontal stripe turned on the bias (45 degrees) will always be greater than the width of the stripe in its normal horizontal position, so matching the two is difficult. The stripe is quite wide and there are about six of them (alternating light and dark) on the skirt. I can get about three of of the horizontal/bias stripes to work out but that's it, so I have to figure out where it's most important that the stripes match. I decided that taking a break to give myself some time to think about and sketch this stripe match would be best, so I went for a walk. It was a beautiful, warm, sunny day I ended up walking for nearly two hours! There's a wooded area over where we've been house-hunting that I didn't know about and I explored that area as well as some of the other streets that I didn't know. It was definitely the best thing I could have done for myself today... being out in the fresh air was soothing and comforting, especially with tomorrow being biopsy day. I'm a bit nervous about tomorrow's biopsy. At the moment I'm not all that concerned about what the biopsy results will be because I just want to know what's going on - no matter what the answer is, having an answer is infinitely better than not having an answer. I suspect I'll be more concerned about the results as I get closer to receiving those results, but right now I'm most concerned about the surgery itself. I wish there was a way to get answers without doing surgery because I really don't like going under a general anaesthetic and I also don't like the idea of an incision in my neck. I tend not to heal all that well, as you know, and the thought of having yet another ugly scar doesn't appeal to me. Sigh. The end justifies the means in this case and I'm focusing all my energy on getting through tomorrow as calmly as possible. The surgery is scheduled for 1pm and is expected to take about an hour, after which I'll be recovering for a couple or three hours. I'm hoping to be home by 6ish so that I can begin to rest in my own house. Either Ian or I will let you know how things went with an update here sometime tomorrow. Thank you all for the good wishes and happy thoughts you've been sending me - I really appreciate all of them. Seriously, I enjoy watching Ian play an open-world game, where there are quests and stuff. I'm not good at the controls for the games but Ian is good at them and he's patient enough to let me suggest where he should go next. It's like I'm playing the game but without actually playing it. This game has lots of cut scenes and an interesting background story as well. I did manage to pull us away from the game long enough to take a walk around the neighbourhood. We should have gone earlier or later as it was still pretty hot outside but it was still a nice walk. I thought about going for another walk this evening (I love love love walking outside in the early to late evening) but I was too tired. I didn't sleep well last night so I was extra-tired today; if I'd slept well I definitely would have been out and about this evening. I'm a little stressed with the biopsy coming up on Wednesday. I was able to pin-fit the bodice top today and after doing that, I added a little bit extra length to the bust to cover it and some other extra length to the center because it was just a little bit low. I'm quite confident that it's going to fit me pretty well. I'm hoping that tomorrow I'll be able to cut out the dress and baste it together. I'd like to try and get that stuff done before the biopsy so that I'm not left with too much to do afterwards. I'm not really liking this "life without Celebrex" thing. As the painkiller leaves my system I'm experiencing more and more pain in all of my joints, especially my hips. I think the pain is also worse because of the rain and humidity we've got. I wish that knowing what caused the pain made it go away. To take care of the pain I've taken a couple of baths already today (hot water definitely helps) and I've been taking Percocet regularly. Both things make me sleepy - but when I'm asleep, I'm not feeling the pain, so it's a way of dealing with it. I did start working on the patterns, though. I started looking at the more difficult one and ran into a bit of a roadblock. Normally I shorten the front and back bodice by about 1 1/2" but the front of this pattern didn't need to be shortened that much; in fact, the front needs to be shortened up near the shoulder and lengthened around the bust. And I think the side seams are the close to the right length. I've been thinking about this and I think I know why these adjustments need to be made. I think there are two things going on here. First, my back is very straight and so it needs to be shortened more than the front, and I've been adjusting patterns based on my center back measurement. Second, I have a large bust and so I need more fabric to cover it. If I shorten the bodice below the bust there just won't be enough fabric to cover it. Adjusting patterns used to be easier but since I've gained weight my body's proportions have changed. My bust wasn't always this big in comparison to the rest of me - or at least, the weight was distributed more in line with commercial patterns. Now that I've got that figured out, it should be fairly straightforward to make the right changes to the bodice. The back and skirt are very easy to modify, and the other pattern is also much easier to change. The best part of today was that the baby chipmunks have appeared! They're so cute!!!! There were two of them with their mommy and they were just learning about exploring their environment. We tried to get some pictures but they didn't work out. They're super-cute, though! I think tomorrow the rain is going away and it's going to get more hot and less humid, so hopefully I won't have nearly as much pain and I'll be able to do more. This is a long weekend for us here in Canada and since we have no plans we're looking forward to just hanging out. It was supposed to be rainy this weekend but I think the only day we might get rain is tomorrow and then after that it's going to be warm and sunny. If we do anything other than a couple of errands, it'll be going for a walk in a new-to-us area of the city. I expect that Ian will play video games for most of the weekend while I work on my patterns. Did anyone else see in the news that some scientists have been able to create a synthetic bacteria by creating and inserting DNA into an existing bacteria? Not everyone thinks that this is good; they worry that the technology will be used to create bioweapons or something. To me, this ranks extremely high on the coolness factor - I think this discovery is awesome! They're creating news life, here, almost. It's not the same as having life emerge from a chemical soup, but this is definitely a step towards that, and there must be good possibilities for this and subsequent technologies. I wore the flat pair of shoes that I bought last weekend out for a walk today and I'm pleased to report that my feet didn't hurt! I do have one small blister on one foot but that's not bad for that kind of walk. Normally I have a few big blisters when I wear new shoes out walking because I walk fast. Plus my heels are narrow so shoes my shoes slip, almost guaranteeing blisters somewhere. I had worn the shoes out and about on Sunday so it wasn't like this was the first time I'd given them a try. This was just the first time that I wore them for a while under more normal conditions. Today's walk was also worth noting because I chose to go out without my cane. Yes, I went for a walk without my cane. Before you yell at me for not taking care of myself, my back and hips haven't been hurting lately and I thought that going for one walk without it would be ok. I won't be able to wear high heels again because I'm too scared that I'll hurt my back, but I think it is possible that I could walk without my cane some of the time. On another subject - when I finish each dress, I'll make sure there are photos :) I was looking at the one I wanted to do first and I noticed that it calls for all the non-faced seams to be French seams and it has instructions for finishing the zipper seam edges with a Hong Kong binding seam finish (see this Threads article for more instructions on these finishes - and now I think I want a bird and clamp tool). Normally I'd just sew and then serge the seams to prevent raveling, but you have to admit that enclosing every raw edge makes the inside as attractive as the outside of the garment, especially when dealing with lightweight fabrics. I expect that I'll be serging the first dress, like normal, but I might just finish subsequent versions properly. We'll see. The difference between these two patterns is mostly in fabric weight: the first pattern needs a fabric that has slightly more body than the second. I've bought a lot of fabric over the years so I have a ton of fabric that will work with the one or the other pattern. It's a very simple dress and I know that it can look ok on me. The key will be to add a bit of a waist that the pattern currently lacks; I might also need to add a seam in the back so that the dress isn't so shapeless back there. Even so, this is a simple silhouette that will be easy to make up and will be easy and comfortable to wear. I'm so excited and I'm really looking forward to doing some sewing in the next little while. I've booked my pre-surgery clinic appointment for next Wednesday morning. They say the appointment can take up to three hours so it's a good thing that I don't have anything else to do that morning. Now that I know when the surgery is and everything, I've booked my flight to see my friends. I had already set aside the dates and made sure I'll have a hotel room but I didn't want to book my flight until the surgery was all set up. We're meeting in Atlantic City the first weekend of June (June 3-6). There are no flights from Toronto or Waterloo to Atlantic City so the next best thing is to fly into Philly, take the train to downtown Philly, and from there take the regional train to Atlantic City. It sounds a bit cumbersome but it shouldn't be too bad. The worst part will be waiting for connections but the rides themselves should be straightforward. I won't be taking much luggage with me to make everything easier. I think there must have been some kind of sale going on or something because I managed to get a direct flight return to Philadelphia from Toronto at a great price. The direct flight is only an hour and a half which makes the extra train travel bearable. If I'd had to make a connecting flight the entire trip would be too much, especially since I'll be recovering from surgery. When I'd been checking into flights before, the price for direct flights was way too high. Getting the direct flight cheaper is definitely a bonus. I'm really excited about this trip even though it'll be so soon after the biopsy. There's a bunch of us getting together to spend time with each other; it's the same group that I've met a few times already. It's been a long time since I last saw them and I've missed them a lot. This trip will be a good, emotionally healing thing for me, I think. About a month ago, our realtor showed us a property that she thought would be right for us. That property turned out to be wrong for a bunch of reasons, but it almost worked. So when the house next door went up for sale today, we jumped at the chance to see it. It turns out that the place we saw today is just about perfect. It doesn't have a walk-out basement but there's light coming in on both sides of the basement so it's really bright. The layout of this place is just right for us: on the main floor is the master bedroom with walk-in closet and ensuite, an office that we'd probably use as a library, a powder room, and the kitchen and dining/living room. There are patio doors leading out to the modestly-sized backyard. Right now, half of the backyard is taken up by gravel with only a bit of grass (which is still enough for the doggy we'll get). We'd put a deck there eventually. The kitchen has an island that creates a hallway between the foyer and living/dining room; we like the island because it's a huge work area for us. The kitchen also has a separate gas range and oven components. Oh yeah, and there are skylights in the kitchen and the powder room. And the ceiling on the main floor is vaulted, creating an airy feel. Downstairs is divided up in the same way as the main level: a great room that would be an entertainment area for us on one side and two bedrooms and a full bath on the other. There's a small workroom down there, too. We'd use one of the bedrooms as my sewing room and the other as a guest room. We don't love the current colour scheme in the kitchen and main bath (as well as the carpeting), which is dark seafoam. The sink in the powder room is quite unique in a way that we're not; it's acrylic made to look like bubbly clear glass, which we'll want to replace. Also, the workroom is quite musty-smelling and there's a bit of a pet smell throughout the house. The house has been unoccupied for a bit and we did have some rain a little while ago, so some mustiness is to be expected here. Another thing that's weird is that the fuse box is in the garage, which is also connected to the house. I don't know how we feel about that. Overall, we love this house - we definitely love it more than the other house. This house is cozy but not small and would easily work for us. Plus it only costs a bit more than the other house. Yep, it's way below our price range - another plus! We're going to go back to see the house tomorrow, and Ian's parent's are going to come with us. This is a huge purchase and we want another set of eyes before we put in the offer. Oh - and if we do put in an offer, we can take possession of it right away. We're a little nervous, and a lot excited, about the prospect of possibly putting an offer in for a house of our own. We'll see how these next few days play out. Hopefully no one else will love this house like we do. I hope that all of you who are mothers (including my own mother) were treated to something special today - even if that something special is getting a phone call from your kids :) None of us would be here without our moms, and it's sad that really only properly honour our mothers for the work they did to raise us. Today we decided to see two 30-year-old houses that were way below our target price. The first one had a fantastic layout but was located next to a busy street and would have needed major, major work. For example, we really want a deck off of the kitchen for barbequing and this place didn't have one, or even have patio doors for one. That reno alone would be costly, and that, together with the cost to replace all the flooring, windows, and baths, is just too much. Still, if the house had been updated we'd have considered it. The second house also had a great layout both on the main floor and in the basement. Unlike the first house, this one had been updated with new floors and stuff. It had a lovely kitchen and the bedrooms were a decent-enough size and everything was bright and in great shape. The yard was awesome and backs onto that forest I walked through the other day. The house didn't have a deck but it did have steps down to a patio, so a deck could be put there. It also didn't have a master bedroom ensuite or walk-in closets, but one of the bedrooms could be converted into those. We'd like to have an ensuite but we've lived without one for so long that we'd be ok living without one for a while longer. The tub would also need to be updated to be a nice soaker tub. The basement does have a walkout but it's not a patio door walkout - it's a door with stairs leading up to the yard, which is kind of weird. Also, there are a number of steps to get in or out of the house which isn't ideal for me - but those could be updated, in time. The house is definitely move-in ready for us with the potential to be updated down the road. Even with all of those negatives, we actually really liked this house quite a lot and could easily see ourselves living there now and in the future. Unfortunately, our realtor is on vacation and if it's still available when she gets back we'll see it with her and get her opinion. We could see it with the fellow who's taking over for our realtor but we don't have a connection with him. If this house is sold by then, there will be other houses. We'd thought about going other places today but the wind was really strong. And it snowed a bit (making the fact that we haven't taken off the snow tires less silly). So instead, we watched a movie: Steel Trap. The acting wasn't fantastic but the story was interesting. Basically, a group of people at a new year's party are texted to go to an invite-only party in the same building, and they end up getting hurt and killed. It ended up being suspenseful with a bit of a mystery. There was some gore but not too much - definitely less than in most of the movies we watch. So if you like interesting, suspenseful, murder mysteries with a bit of gore and you don't mind sub-par acting, you might be interested in seeing Steel Trap. Although I had plans to get started sewing, I still haven't tidied up my work area. If I knew what pattern I wanted to work with first it would be easier. I really want to sew one of the patterns that I ordered but I don't know when they'll get there. 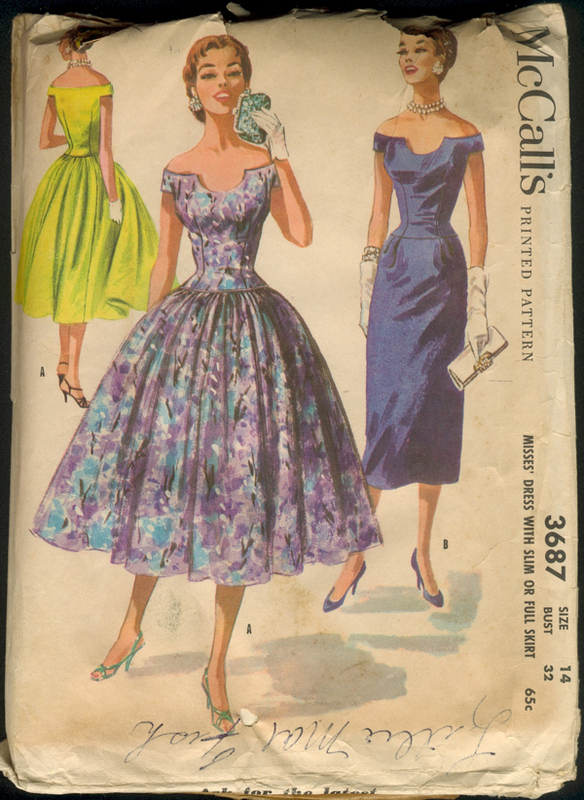 There's always vintage patterns, but I would have to pick just one. Thanks for all of your thoughts and ideas about meal-planning; I appreciate it. I'm not very domestic, as you probably know, so this is all a new world for me. Back in the day, women were trained to be domestic goddesses and the better they were at it, the more they were valued. It's a good thing I wasn't born into that world because I don't think I'd have made it there. I'd planned to clean up my upstairs work table today but I didn't get a chance. I needed to pick up a prescription and after I walked to the drug store it was so nice that I went for a longer walk. One awesome thing about Waterloo is the community trail system. It's possible to walk almost everywhere without being being on public roads which makes for a very nice walk. This time of year is especially nice for walking because the leaves are coming out and the flowers are blooming. Anyways, I ended up walking for over an hour so I didn't get a chance to clean up. 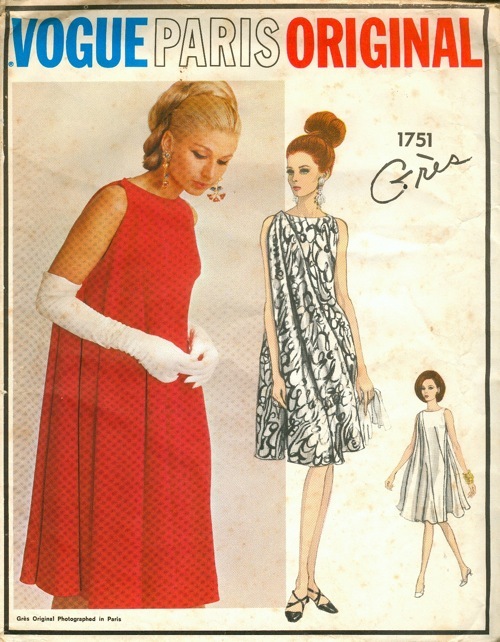 I haven't totally decided what I want to sew first, although I know that I want a dress of some kind. I did receive this pattern today that I'd love to make up but I'm not sure it would suit me. Vogue Paris Original 1751, 1960s. This is a highly collectible pattern, and I paid more for it than I'd like to, but I love it. Really, it's just a sheath dress with a half-circle drape over the right shoulder but somehow it just looks so gorgeous. I think I like it with a chiffon drape, as in the smaller pictures, but an organza drape like in the red would be more dramatic. Actually, that red drape is a crepe or something similar; organza would be sheer like chiffon and fall into dramatic cones. What do you think of this pattern? Am I dreaming that it could work for me?